The HTC “Flounder” or “Volantis,” whichever you prefer, is more than likely the new Nexus tablet from Google. Both codenames, which reference the same device (yes, Google gives all Nexus devices two names), have appeared a handful of times in official Android changelogs and also in detailed rumors. Thanks to a Wi-Fi Alliance certificate that went unnoticed on August 15, we have another sighting to add to the list. 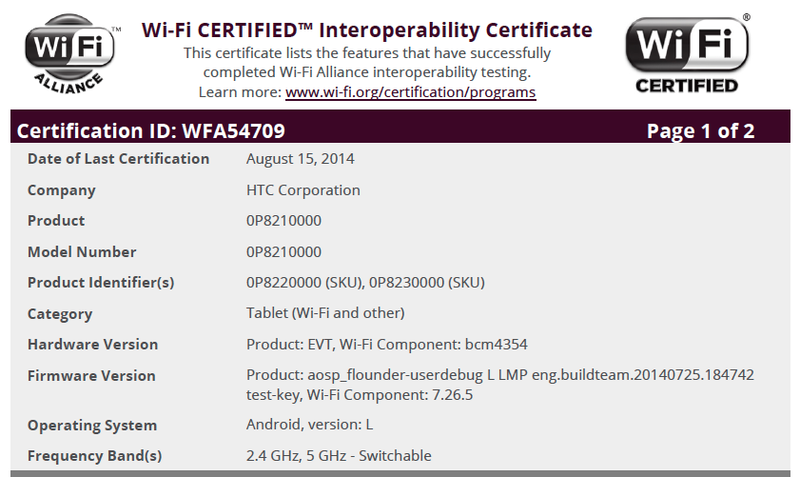 The Wi-Fi certificate clearly shows that a device made by “HTC Corporation,” that is a tablet, runs “aosp” Android L, and carries firmware that references “flounder” is the real deal. There aren’t many other details in this listing, other than a mention of the model numbers 0P8210000, 0P8220000, and 0P8230000. The first number isn’t new, but again, matches up to previous leaks. You have to wonder now if three separate SKUs means multiple colors and/or multiple storage sizes. Previous Nexus devices have all had multiple colors and/or storage options, so that wouldn’t be a shocker either.